By Worshipful William H. Squires, Jr.
At this centennial celebration of Vernon Lodge, we pause to look back to our origin, and what has happened since. At this time it seems also fitting to recollect the original Lodge chartered in this town, 163 years ago, by the name of Mt. Vernon Lodge, chartered March 9, 1807. This Lodge evidently worked and prospered for a number of years until the Anti-Masonic period, which began in 1826. According to a notation in the Mt. Vernon Lodge Bible, the Lodge was dissolved in 1828. The Anti-Masonic period began in western New York, when William Morgan, a Royal Arch Mason who had fallen into debt, tried to make some money by publishing a book describing secret Masonic rituals. He had obtained a copyright for the book, but before it was published, he vanished. Popular opinion claimed that he had been kidnapped by the Masons and drowned in the Niagara River. Many rumors and stories were started, some plausible and perhaps had some basis of fact, others were incredible and not more than a flight of fantasy. Human emotions entered into the picture, and finally it was made a political issue. After that it was impossible for anyone to separate fact from fiction. In spite of charges and investigations and indictments, nothing much was ever proved and the whole truth remains a mystery today. From this weird episode sprang the Anti-Masonic Party. The seeds for the formation of the Anti-Masonic Party fell on fertile ground, since many offices were held by Masons and those who were "out" saw another opportunity to get "in". The Anti-Masonic Party was especially strong in New England and New York. In 1832, the Anti-Mason ticket carried Vermont and ran ahead of Jackson in Massachusetts. Feelings ran very strong; businessmen were boycotted because they were Masons, men suspected to be Masons were stricken from the jury list, thrown out of public office, and refused membership in the church. Anti-Masonry even divided the Congregational Church here in Belchertown, with the Masons leaving to form a new church. Brother Mark Doolittle, a lawyer and member of Mt. Vernon Lodge, wrote in 1847 that: "There was a violence an implacability and persecuting spirit prevalent that surpassed anything that I ever before witnessed. It was manifested in town meetings, society meetings, church meetings. It began in 1829 and raged for six or more years, and its dregs are yet among us". The Anti-Masonic Party was not founded upon a firm foundation and it disappeared as a political menace almost as quickly as it appeared. By 1840 it had all but vanished, but the bitternesses left in the community after its passing took a whole generation to erase. Even though Mt. Vernon Lodge was forced to dissolve, some of its surviving members helped to re-open Lodges in nearby towns when the Anti-Masonic furor subsided. Today, one hundred years later, we cannot say what prompted the meeting, and we can only guess at what went on before; but on Monday evening, January 15, 1869 "Mt. Vernon Lodge of F. and A. M. met at Brother Tobias' office at 7 P. M." Since they had no charter empowering them to work, they evidently assumed that they were going to re-activate Mt. Vernon Lodge and have its charter renewed or re-instated. This would have been wonderful, but it was not to be. It is also evident from these earliest minutes that they had somehow already chosen a slate of officers. One of the principal actions of the meeting %vas to get a petition in to Grand Lodge, but due to inexperience this intention miscarried and a petition was not entered until sometime in May, 1869 and dispensation was granted May 18, 1869. Meanwhile "Mt. Vernon Lodge F. & A.M." continued to meet and settled such things as the meeting date which was agreed would be the "Wednesday on or preceeding the full of the moon," and that there would be 13 communications per year. They also agreed to meet at Brother White's, (this I believe was a hotel on the site of Lawrence Memorial Hall,) and soon after "voted to purchase one central lamp of four burners and others sufficient to light the hall." "The Most Worshipful Grand Master directs me to say to you that the name of your Lodge must be changed before a charter is granted. We now have one Lodge by the name of Mt. Vernon; located at Maiden and it is deemed not desirable to duplicate names. You will find a list of the Lodges in the jurisdiction in the Grand Lodge proceedings of 1869. And on June 4, 1870, "the Lodge voted unanimously to change the name from Mt. Vernon to Vernon Lodge." A special communication of the Most Worshipful Grand Lodge was holden at Belchertown for the purpose of constituting and installing the officers of Vernon Lodge. "The Grand Lodge was opened in ample form with prayer by the Grand Chaplain, Rev. C. H. Titus, after which Vernon Lodge was constituted a Lodge of Free and Accepted Masons. "The following officers were then installed by the officers of the Grand Lodge as Officers of Vernon Lodge for the year ensuing. Vernon Lodge was then closed in due form." On August 28, 1870, records show a membership of 28. By 1875 membership had grown to 50. In 1880 it was 57. The Lodge continued to grow and in 1890 membership was 66 and in 1900 it was 71. The records are not too clear about the early days, but one of the big problems was that of finding a suitable meeting place. Very likely one of the early meeting places was in the old Union House that sat on the site of the Lawrence Memorial llali. Evidently the meeting place was not very desirable, for we find that in 1872, they "voted to request the Selectmen to insert the following article in the warrant: "To see if the Town will authorize them to rent for ten years, the room over the High School for a Lodge Room." This seems not to have passed. However, in July 1880, the Lodge began paying rent to Brother W. H. Bridgman on what is most likely the present location. On August 26, 1886 a Special Communication of Vernon Lodge was held and the members participated in the laying of the corner stone of the Court House at Northampton by The Grand Lodge. Some of the difficulties of ritual were solved when Lodges of Exemplification were held. The first notation that such a Lodge was held was on May 25, 1888 when it was held at Bethel Lodge, Enfield (now under Quabbin Reservoir). Thereafter Lodges of Exemplification were held with increasing regularity. This cleared up some of the difficulty of the early days when the Lodge voted to send one of their Brothers to some distant Lodge or even to Boston to "get posted", (meaning to get posted or informed on the ritual). The Lodge continued to have financial problems. It was nothing severe, but the Lodge was still not in a comfortable financial condition. To assist the Lodge in paying its rent, it subleased its quarters to the Grange and to the G. A. R. and to others during the period from about 1889 to 1901. These were evidently difficult and trying years, and even though new members were joining, older members were dropping out. There evidently were no major issues, and all that can be said is that the Lodge membership did not appear to be stable. One of the men who appeared to be among the biggest benefactors to Vernon Lodge at this time was its landlord and several-time Master, Brother William H. Bridgman. He served as Master of Vernon Lodge at three different times and for a total of eight years. One year after his final term as Master, on December 31, 1896, Vernon Lodge had a gala celebration. At this Special Communication, the new officers were installed and afterward the Lodge was informed by its District Deputy Grand Master, William S. Clark, (member and Past Master of Vernon Lodge) that Brother William H. Bridgman had built the new dining room and kitchen for the use of the Lodge and presented it to them for dedication. Brother Clark then spoke of it also being the fiftieth wedding anniversary of Brother Bridgman and his wife. According to the minutes over 100 brethren were present for this occasion, many from Bethel Lodge of Enfield. An enjoyable evening must have been had by all. On July 16, 1899, Vernon Lodge held a Special Communication to attend the funeral of Brother William H. Bridgman. There was a large number of brethren present. Later, a resolution was passed in which two of the resolutions were: "that the many Masonic virtues of our deceased brother were so illuminated by practical application in his daily life, that the memory of them will ever live in our hearts, and stand forth as an example for emulation," and, "that the brethren of Vernon Lodge remember with sincere gratitude the earnest labors and generous gifts of our beloved Brother, for the maintenance and growth of our Lodge, and the firm establishment of the ancient landmarks of our fraternity in this town." Mt. Zion Lodge of Barre, which was in our district at that time, celebrated its centennial on October 3, 1900. Eighteen members of Vernon Lodge attended. Shortly afterward, Bethel Lodge of Enfield suffered a fire, and on January 2, 1901, Vernon Lodge voted that a committee of three be appointed to attend Bethel Lodge at some future date and present them with the Holy Bible, Square and Compasses as gift from this Lodge. On October 8, 1901, Pacific Lodge of Amherst celebrated its centennial, and twenty-seven members of Vernon Lodge attended. During 1902, the Lodge was perhaps feeling relieved of its financial pinch for they bought new collars for their jewels at a cost of about $45. The next year, on April 8, 1903, we read in the minutes of its regular communication and quoted in part: "This property we have so long occupied, being part of the estate of our late Brother William H. Bridgman, was sold at Public Auction this day, but the Lodge, not knowing at the time of its regular meeting that the sale was to take place before this meeting, took no action in regard to the purchase of the property. Several members, however, being anxious that the Lodge should own the property, 'consulted together', and after asking the opinion of every member they could see on short notice, decided it was the wish of all that the Lodge should purchase the property. Therefore, Bro. F. D. Walker at the time of the auction bought the property for $1825, with the understanding that it was for the Lodge if they voted to accept it. After this explanation it was unanimously voted to accept the act of Bro. F. D. Walker in purchasing this property, as the act of Vernon Lodge." One of the first acts which the Lodge had to do after purchasing the property was to renovate for the Post Office. After the purchase of this property, the Lodge began to take on life of its own, and rather than its life being sustained by a few persistent members, we began to see more members becoming active. Many individual members began to contribute small items to the Lodge. No item was perhaps a necessity, but they could be classed as luxuries, and nice to have. The Rough and Perfect Ashlars were presented in 1904, as was the Hourglass. Bro. A. F. Warren located and procured one of the original Mt. Vernon Steward's jewels and presented it to the Lodge on December 21, 1904. The notation on the jewel in the Lodge display case says the jewel was found concealed in the walls of the building. Perhaps it was located during the Post Office renovations. Two big helps to Vernon Lodge came into being about 1905. A Chapter of Eastern Star was formed here about that time. It has been a valuable asset to Vernon Lodge ever since. The Doric Club was also formed at this time. It was originally called the Masonic Club. It has assisted the Lodge in many of its ventures. In passing it might be noted as a sign of the times, that on September 26, 1906, it is mentioned in the minutes that the Lodge erected new hitching posts, (for horses). In 1910, Bethel Lodge of Enfield burned out again, not as severely as before, and Vernon Lodge voted to donate $10.00 for their assistance. Belchertown celebrated their 150th anniversary in July, 1911, and as its part in the pageant, Vernon Lodge portrayed Lafayette's visit. Lafayette was a Mason and visited this town in about 1825, perhaps on his way to lay the cornerstone of Bunker Hill Monument. He may have visited the old original Mt. Vernon Lodge at that time. The tempo of living was increasing after the turn of the century. Late in the year 1912 the Lodge voted to have electric lights installed. In 1919, they paid $2.00 to have the street hardened (for oiling the street) in front of their property. Activities within the Lodge also took on new life. New officers' aprons, and presentation working tools were bought, and 40 feet of "settees". The Lodge also decided to present a Past Master's Jewel to all its living Past Masters still retaining membership in this Lodge. World War I also made its impact felt upon the Lodge. Several members were evidently called to active service, for in October 1918, the Lodge voted to exempt all members in the U. S. service from payment of dues "during the present war". One of our members, Warren B. Wright, lost his life during the War. He took his degrees in 1916, and lost his life in the service in 1918. Early in 1919, the Henry Price medal was conferred upon Henry M. Jepson. He was a charter member of Vernon Lodge, having taken his degrees in Bethel Lodge, Enfield in 1866. He had been a member of the craft for over fifty years, and a member of Vernon Lodge for nearly fifty. On October 20, 1919, Levi Arnold, the second Worshipful Master of Vernon Lodge died in Stafford Springs, Connecticut, where he had resided since leaving here in 1874. He had a watch repair shop and store in the building that now makes up the northern section of the Masonic Block, which he still owned at the time of his death. The Lodge was interested in this property, and on Sept. 22, 1920 voted: "Unanimously, that the trustees be empowered to borrow the money needed to pay for the Levi Arnold property purchased August 29 and to make the mortgage note on all the real estate to cover this and the old mortgage, making a total of #3,450. on one note. Thus ends the first fifty years of Vernon Lodge. No celebration was made and no history recorded this and perhaps it passed unnoticed. Several cases of hardship among the older members of the Lodge to keep up dues were noted. On June 7, 1922, the Lodge voted "any Brother who has been a member of this Lodge in good and regular standing for SO years shall be exempt from paying dues for the remainder of his life." Improvements to the Temple came along at a good pace. On November 1, 1922, we find a notation at the end of the minutes: "The raising of the ceiling etc. in the Hall was completed yesterday and the Hall now looks very fine." Previous to this the ceiling had been 3 to 4 feet lower and the Lodge had long been stymied in its attempts to cure this defect. The raising of the ceiling and the installation of a ventilator fan made the heat more tolerable during the warmer weather. On November 9, 1923, R. W. Alvan R. Lewis, D. D. G. M., made his last official visit to his home Lodge. He was Superintendent of Schools here for many years. He served as Senior Grand Warden in 1927. Shortly after this, another well-known to Vernon Lodge, but at that time a member of Bethel Lodge, took over as District Deputy Grand Master. H. Morgan Ryther held office as District Deputy in 1926-27. Since the dissolution of Bethel Lodge he has become a member of Vernon Lodge. More property improvements came. The Lodge was among the first to take advantage of the new public water system, and had their buildings connected in 1924. During the years 1930 and 1931, some interest was shown in the original Mt. Vernon Lodge and pamphlets were discovered pertaining to the era. As early as 1932, the Lodge began to investigate the possibility of incorporating a building association. Since the Lodge had begun to acquire considerable property, it became necessary to take the proper steps for its administration. On November 4, 1936, the Vernon Lodge Building Association was formed. During 1934 and 1935, R. W. Winfred Forward, Past Master of Vernon Lodge, served as D. D. G. M. of the Palmer 19th Masonic District. A devoted and active member of our Lodge, he served many years as Treasurer. In the early 1940's, the original Bible of Mount Vernon Lodge was discovered in the home of Howard Dickinson of South Main Street (formerly owned by Lucy Thompson, daughter of Mark Doolittle). Bro. Charles L. Randall presented this Bible to Vernon Lodge as a gift from Howard Dickinson on March 5, 1941. During World War II, many of the Brethren served in the armed forces. Before the entrance of the United States into the war, Bro. James R. Collard, son of R. W. James L. Collard, M. D., lost his life in a plane crash while on duty with the U.S. Navy, on March 5, 1941. Most of those who died in service during World War II were too young to have been admitted to membership before they were called to duty. R. W. Everett A. Geer served as District Deputy Grand Master in 1944 and 1945. A Past Master of Vernon Lodge, he served as Treasurer for many years. He raised all of his sons in Vernon Lodge except one who gave his life in the service. In 1946, Bro. William E. Shaw retired after 20 years of service as Secretary, and Wor. Isaac A. Hodgen was installed as Secretary. After the war, when materials were again available, improvements to the Lodge property were made. In 1949, the porch which extended around two sides of the building was removed, and also the property was connected to the sanitary sewer. In 1950, Jackson's Store, at the northerly end of the block, was extended toward the front to be even with the main block. On October 27, 1956, R. W. James L. Collard, M. D., received the Joseph Warren Medal, the first time this honor had been bestowed on a member of this Lodge. This was bestowed after the completion of a public installation in Lawrence Memorial Hall. In 1957, the portion of land to the rear of the adjacent stores was sold to those property holders and the barn that stood there was removed. Another devoted Brother, R. W. Everett A. Geer, received the Joseph Warren Medal in Vernon Lodge on March 6, 1963. In October 1962, the Post Office moved to new quarters in its own building and the space was vacant until 1964, when a branch of the Hampshire National Bank became the tenant. But before this came to be, more changes came. In 1964, an estate was finally cleared, and the Building Association was able to purchase a run-down store which divided the Lodge property. The building was razed and the space enclosed to unify the Masonic property and greatly improve the appearance of the whole. In 1964 and 1965, R. W. Isaac A. Hodgen was appointed as D. D. G. M. of the Palmer 19th Masonic District. During those years he continued to serve as Secretary of Vernon Lodge, finally retiring in 1968 after twenty-two years in that office. Wor. Frank W. Grover was elected as his successor. The last bit of history that I must record is that in 1970, R. W. Kenneth L. Collard, M. D., was appointed as D. D. G. M. for our District. He follows in the footsteps of his father, R. W. James L. Collard, M. D.
The celebration of our centennial in this year of 1970 completes 100 years of Vernon Lodge in Belchertown and if we had not been in darkness for forty years, would have been 163 years. No history of Vernon Lodge would be complete without the mentioning of this important social activity of its membership. Like "Topsy" it just came into being and down through the years has been an integral part of the togetherness and informal relaxation of all who entered its associations. Over the checker and cribbage boards, the card and pool tables, many a profound and pithy forecast has been made. Like the old country store, especially when its quarters were heated by an old chunk stove, it provided a forum for much gathering and dispensing of the news and current events, both community-wise and world wide. As time changed and increasing commitments limited attendance at the weekly meetings, the Club has maintained its quarters and facilities. The same welcome feeling still abounds and an evening of relaxation and good fellowship are still to be found among those there. Milt Baggs and Howard Spencer, each with over a half century, still qualify as "Champs" in their respective activities whether it be in the program or in providing the "chow" for the evening. And we are proud to say that it is still a grand place to relax. By Wor. William H. Squires, Jr. The history of the original lodge here is lost, concealed by a veil of time. Through surviving articles and records, we are able to get occasional but only partial glimpses of the lodge and its members. We know who some of the members were, and can only conjecture on others. For instance, at the end of the revolution, the American armies camped in the Hudson Valley near West Point, Masonic Lodge meetings were held. Washington and many other leaders were made Masons in these army lodges. Probably the returning veterans had much to do with the formation of Mount Vernon Lodge in March 1807 (named after Washington's plantation). One of of the early members may have been Dr. Estes Howe. When Lafayette (a Mason) came through town in 1825 to officiate at the laying of the cornerstone of the Bunker Hill Monument (a Masonic function), he stopped to visit the old doctor who was a war veteran now stricken with paralysis. This little lodge prospered for about 20 years, receiving new members and participating in the life of the community. If we look at its members, we see that a large part of the carriage industry in town belonged to this lodge. Out at the other end of New York State, in September 1826, a William Morgan (a Mason who was in debt and had announced that he was going to publish Masonic secrets) disappeared. The Masons were blamed, and many rumors and stories were started, making it difficult to sort fiction from fact. Emotions ran high, and finally it became a political issue, and engendered the Anti-Masonic Party, which could never afford to let the issue die. For the first few years it was especially strong here in New England. Businessmen were boycotted because they were Masons, men suspected to be Masons were removed from the jury list, thrown out of public office, and refused membership in the church. None of our local members was ever accused of any wrongdoing, but they were Masons and therefore persecuted. This political party leadership as not large, consisting in part of Dr. William Bridgman, Justus Forward (son of our second minister), and a few others. One of the former members of the lodge, Reverend David Pease, came back to preach against his former Brethren. The attack against Masonry was well-timed and well-executed. A notation in the Lodge Bible on the presentation page says that the Lodge was dissolved in 1828. The Anti-Masonic Movement continued unabated in this town for several years. By 1840 or so the Anti-Masonic Party faded from view nationally, and here in our own town. After closing the lodge, dividing the church, and disrupting order in government, the people had enough, and began to work toward reconciliation. The Lodge did not reform, however, until after the Civil War, when Masonic membership was swelled by the activities of army lodges, and prejudices were subjected to a variety of views caused by large groups of men living together. By the time the Civil War was over, the Anti-Masonic Party was dead, and most of those who participated in its battles were dead also. A new generation, somewhat worldly-wise emerged, and a new era in Freemasonry was ready to begin. This lodge began its reconstruction in 1869, after the Anti-Masonic Movement had run its course. The early members expected to renew the charter of the earlier lodge, Mount Vernon. This was not to be. In the intervening years, a group of Masonic in Maiden organized under the name Mount Vernon, so when this lodge was constituted, it could not assume its original name. It adopted a name close to the original, and chose the name Vernon Lodge. (The Grand Lodge of Massachusetts is the only jurisdiction in the United States where lodges do not have numbers. In all others, every lodge has a name and number). After Mount Vernon ceased to meet, "For The Sake of Peace" in this troubled community, the lodge no longer held any communication with Grand Lodge. Although the Lodge never formally dissolved, it virtually went out of existence about 1830. Years later some of its former members joined surrounding lodges, moved out of town, or passed away. Forty years later, when the new Lodge was formed, it is believed that nearly all the members of the original lodge were dead. There is no evidence that any of them participated in any way in reforming the lodge. The charter members of this Lodge lived in town, but were members of surrounding lodges. Presumably, there were enough of them who found it inconvenient to travel to lodge, that they decided to form their own lodge here. Upon its reorganization, the lodge did not have a meeting place of its own. The earliest meetings were held in Brother Tobias' office. In 1869, Brother Chapin (a lawyer and charter member), owned the meeting place. In 1869 and 1870, rent was paid to H. F. Reynolds. In 1872, the lodge voted to request the selectmen to rent them the room over the high school; however, this seems not to have been approved. Other places where early meetings may have been held was at Brother White's (the hotel which stood where Lawrence Memorial now stands). In 1874, rent was paid to Dexter Davis. This continued to be so until 1880. In 1880, the hall was rented from W.H. Bridgman. (This is our present location). Indeed, our lodge probably has met in its present location since its reconstitution in 1870, and the change in landlord only reflects a change in ownership. We arbitrarily end this early history in 1903, when the lodge acquired its own property, purchased from the estate of William H. Bridgman, several-time Past Master, landlord, and a prime benefactor of our lodge. A remainder of the present lodge property was purchased from the estate of Levi Arnold, our first elected Past Master, in 1920. The period between the Lodge's first acquisition of property until the 1960s was a time of many transitions: electric lights, automobiles, telephone, radio, oil heat, and finally television came into our community. During this time, we fought two world wars and a police action and lived through the Great Depression. All of these affected our community and our Lodge. Certainly life is now in the fast lane compared to those days, and our comfort standards are much better. Our neighborliness and concern for our community demand at least as much attention as they ever did. In an unofficial way, our Lodge has done much to improve our community. Officially, the Lodge as a body never participates in non-Masonic functions. Equally so, it does not prevent any member from participating in any legal endeavor. On this basis, Masons may be found on both sides of almost any controversy. A good exchange of ideas usually results in a much better solution than a simple clash of wills and a deciding vote. Into this atmosphere, we introduce one of the greatest assets of this middle period, the Doric Club. The Doric Club provided an atmosphere of relaxation and fellowship. Some hard-fought pitch games around a wood stove, of a game of pool were only a diversion while the issues of the day were discussed. Contributions by several people helped to form a consensus more acceptable to everyone. It never acted in any official capacity, but many opinions were formed there that were later expressed in official actions of the community. Some of the stalwarts of the Doric Club held public offices or were community leaders in some form. Unofficial opinions of the group helped to guide their official actions. This club carried on through the years, its membership changing, but always a place to go for friendly banter, to catch up on news, to exchange an idea, or just relax. Eventually, this haven of discussion succumbed to the pressure of time. Older members died off, and younger members were better informed through television (or thought they were), and were too busy to drop into the Doric Club. It went out of existence in the 70s without a murmur, and with it went a large part of the social activities for the Lodge. There is no longer a forum for testing our views before subjecting them to official action. Hopefully, the future will bring us to see the value of unofficial discussion and men will become more interested in local issues and problems not covered by television and the other media. None of these can take the place of a person to person discussion, nor can they otherwise hope to deal with the day to day trivialities that affect all our lives. Somehow, in our modernization we have lost a valuable part of ourselves. Two years and fifteen days after the Vernon Lodge building in Belchertown was destroyed by fire, the new Lodge building was dedicated and its cornerstone laid by M. W. Arthur E. Johnson, Grand Master, and his suite. Wor. Anthony J. Papirio, Master, received the Grand Master with a committee composed of Past Masters and the building committee. The Grand Master and the Grand Lodge Officers conducted the dedication ceremony followed by the laying of the cornerstone. M.W. Bro. Johnson placed a sealed container with documents and photos depicting the 126 year history of the Lodge. During the ceremony the Melha Temple Shrine Highlanders played the traditional Amazing Grace. Wor. Herbert Durant, the oldest living Past Master of the Lodge, attended the celebration on his 99th birthday. Wor. Bro. Durant was presented an American Flag and a proclamation from the Massachusetts House of Representatives by State Representative Steven Brewer. The members of the Lodge building committee were introduced and congratulated by the Grand Master. A social hour and a banquet was attended by 150 members and guests. Wor. Bro. Papirio, accompanied by his wife Linda, was presented a proclamation from the Belchertown Board of Selectmen congratulating Vernon Lodge for restoring that part of town after the disastrous fire and recognizing the Lodge for 126 years of contributing to the town. A moment of silence was held for association members Wor. Robert B. MacPherson and R. W. David Staples, who died before seeing completion of the building. Their enthusiasm got the project started. They will be sadly missed. Their widows were honored guests of the Lodge. The evening concluded with a reunion of old friends and dancing on the new dining room's dance floor. Wor. 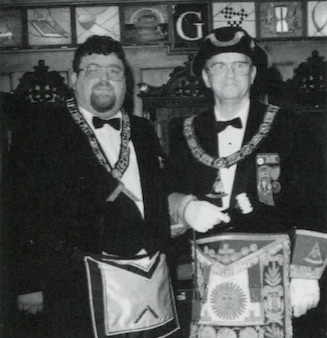 Anthony J. Papirio, Master, and M. W. Arthur E. Johnson, Grand Master. This page was last modified on 28 December 2018, at 09:06.